Parkersburg, WV — In 2015, the Free Thought Project broke the story and the video of a courageous mother, Tiffanie Hupp who stepped in front of an officer who was about to shoot her dog. Of course, Hupp pleaded not guilty, as the video clearly showed that she was the victim. However, the city railroaded Tiffanie by forcing her to use their public appointed defender, with obvious conflicts of interest. “I was shown the video of the incident last August and I found it unjustifiable for Tiffanie to be charged with any crime for her reasonable, non-forcible, actions to defend Buddy the dog. When I was told the lawyer appointed to represent Tiffanie was married to a state trooper and did not inform Tiffanie of this relationship, I decided I would represent Tiffanie pro bono if she wanted my services,” Schles told The Free Thought Project. And, in 2016, Hupp was found not guilty. Now, after that good news in 2016, Hupp has taken the fight back to the city in 2017. A national group advocating for the humane treatment of animals has filed a lawsuit on behalf Hupp. In a release last week, the Animal Legal Defense Fund announced the suit. Randall Hupp, Tiffanie’s father, who gave us the video, explains that after the cops had arrived, the situation was calm, but then they quickly got out of control. 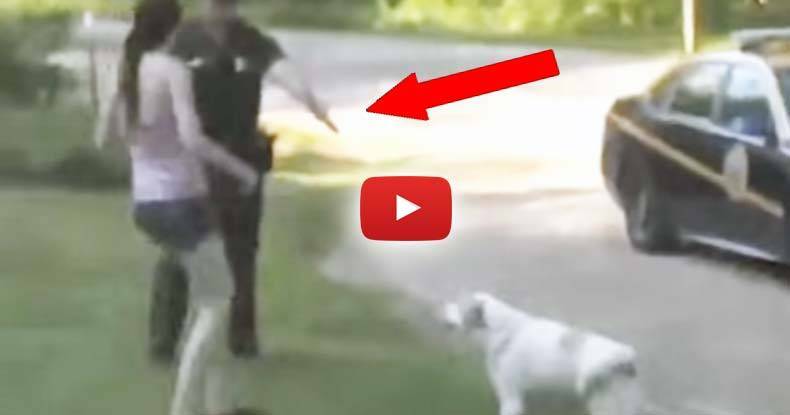 Before the state trooper could shoot the dog, however, Tiffanie courageously stepped in between the dog and the officer to prevent the puppycide. During the trial, Hupp told the Free Thought Project that she had a hard time not bursting out in court when Trooper Cook, who assaulted her, took the stand. Now, it is time for the police, who tried to railroad Hupp, to be held accountable. Hupp and the other plaintiffs are seeking restitution, including funds so her son can be treated by a mental health professional, which they have not been able to afford, the release says. The child suffers from anxiety and emotional distress when in the presence of police officers, the release says, as reported by the News and Sentinel.